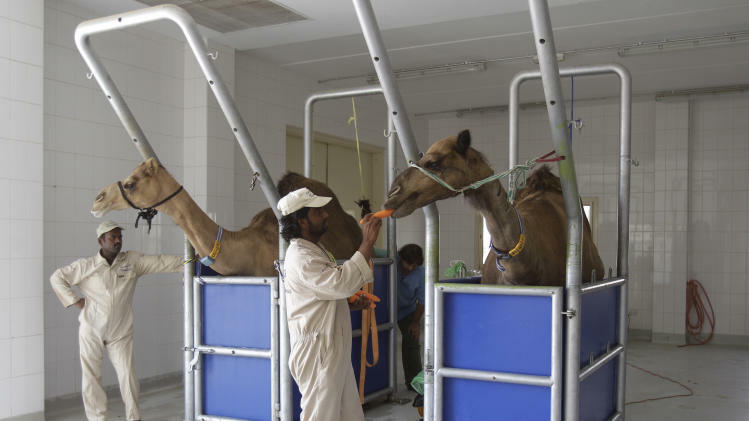 Scientists have found cases of Middle East Respiratory Syndrome (MERS) in camels in Qatar, health officials said on Thursday, fuelling speculation that camels might be the animal reservoir that allowed the virus to infect and kill humans. The SARS-like coronavirus, which emerged in the Middle East last year and has killed almost 40% of the around 170 people so far infected, was found in three camels of a herd in a barn also linked to two human cases of MERS infection. “The three camels were investigated among a herd of 14 camels, and the samples were collected as part of the epidemiological investigation,” Qatar’s Supreme Council of Health said in a statement. It added that the two confirmed human cases linked to the barn “have since then recovered”. Ab Osterhaus, a professor of virology at the Erasmus Medical Centre in Netherlands who worked on the camel study, told Reuters the results were confirmed by a range of tests including sequencing and antibody testing. Scientists around the world have been seeking to pin down the animal source of MERS virus infections ever since the first human cases were confirmed. World Health Organisation (WHO) said in its latest MERS update on 22 November that of the 176 laboratory-confirmed and probable reported human cases to date, 69 people have died. British researchers who conducted some of the very first genetic analyses on MERS last September said the virus, which is from the same family as Severe Acute Respiratory Syndrome (SARS), is also related to a virus found in bats. Dutch scientists said in August they had found strong evidence that the MERS virus is widespread among one-humped dromedary camels in the Middle East—suggesting people who become infected may be catching it from camels used for meat, milk, transport and racing. And Saudi officials said earlier this month that a camel there had tested positive for MERS a few days after its owner was confirmed to have the virus. Human cases of MERS, which can cause coughing, fever and pneumonia, have so far been reported in Saudi Arabia, Qatar, Kuwait, Jordan, United Arab Emirates, Oman, Tunisia, France, Germany, Spain, Italy and Britain. Osterhaus, whose team worked with the Qatar’s health and environment ministries on the study, said that at this stage “no more details can be disclosed” about these latest findings since a scientific paper is in the process of being prepared and submitted for peer review and publication.